Why Nina? This is just for fun simply Why Nina is why fans are fans of Nina! Read the awesome responses below and submit yours as well. Melody – I am a fan of Nina because i have seen her determination and passion for the arts. Her success show that if you keep your eyes on the prize and never give up, you will reach your goal. She has influenced me to follow my dreams which is one of the reasons I am a fan. Also she is so grateful for her fans and tries her hardest to stay connected to them. Either through fan mail, interviews, twitter, and even meet n’ greets. This is why I am a fan of Nina Dobrev. Nina ROX!!! Bee – I’m a fan of Nina because she is sooo talented and plays two characters at the same time (really, who could ever do that? ), because she is a beautiful, fun and nice girl, but above all because she’s such a normal girl, she’s not dazzled by the lights of Hollywood, by the fame, she still hangs out with her friends and spends holidays with her family, she’s always very grateful for the success that the show has (and she has), but she doesn’t behave as if she deserves that, she’s not snob and she’s always kind with the fans. Those are the reasons why I love Nina. 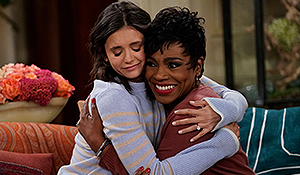 Amber – Well Nina is amazing, talented, beautiful. And the best actress in the entire universe. I just love her so much and I love watching The Vampire Diaries, cuz she plays Elena and Katherine amazing and so different from one another, just amazing. There are not many actresses that can pull it off, but Nina can. And every movie she plays in is just amazing :). She’s an awesome actress (I only say: “Katherine”). Nina has a very nice and loving personality. She is a very talented and beautiful young lady! You are my role model, Nina! Adrean – Just watch her snaps in and out of 3 completely diff characters in one episode is enough said why i luv her!!! Anna – The reason why I love and admire her is because she is everything what I ever wanted to be: She can play the piano – I always wanted to play the piano but I can’t. She is the most beautiful girl all over the world and I can just be jealous of her because she achieved everything I will probably never achieve. Nina can act so good, she can be proud of herself. I can’t believe it! I even don’t notice that Katherine and Elena are played by the same person-I mean, at that moment I forget that Nina is playing both. You’re noticing immediately if she’s playing Katherine or Elena. I don’t understsnd how she’s doing that but I’m a big fan of Nna Dobrev cuz she has the smoothest and nicest hair, she acts super she looks perfect and she can be lucky to live such a life!! I ADMIRE you Nina!! Noémie – I’m a fan of Nina because she’s so natural,lovely and energic, she knows where the priorities are in the life and she takes care about her fans, thinking it’s important. She’s young and fresh, and she can keeps the balance by her alimentation, her job, etc. She’s a too good actress too, and she takes care of earth. She speaks Bulgarian, French and English.I’m from Quebec and my first language is the French so. I’m her fan not by her role on TVD. I’m her fan for her, for the girl who’s Nina Dobrev, because she’s so amazing! She’s talented, beautiful and charismatic. Her laugh is real, when she speaks she’s real too, and we are enchant. For all this reasons, I admire her and i’m proud to be her fan. My dream is to meet her one day, and talk with her. She’s just AMAZING! I love you Nina! Lidija – I think that beside the fact that she’s GORGEOUS, she really has a talent for acting- i would really love that one day she becomes one of the top10 actresses in Hollywood, because she has what is needed for that! Aleks – Why Nina ? Why not? .. 1st of all she’s Bulgarian same as me so that’s why. 2nd of all deffinetly a future Hollywood actress … I mean her acting is great .. especially in the Vampire Diaries, she plays Elena and Kathrine.. which not many actresses can do . believe me . 3rd but not least .. she’s a very good looking. Combine all 3 and you get a future Golden Globe winner.. Submit Yours using the form below.